The compulsory ENGG1000 first year undergraduate course gives students an opportunity to tackle some real-world space-engineering problems very early in their degrees. ENGG1000 is a broad interdisciplinary course taught to all UNSW first year undergraduate engineers providing an introduction to design. In Semester 1 2014 around 1800 students enrolled this course and attempted a variety of design projects across the 9 Engineering Schools. Under the School of Mining, a new project was introduced in 2014 with the theme of Off Earth Mining. "In conjunction with your Mentor you are required to design and construct an item of mining machinery to operate on the moon or in space. You can mine the moon or you can mine an asteroid. I will provide you with specifications for an asteroid ‘miner’ but as this course is all about Design and Innovation all design initiatives are welcome to be discussed with your mentor. It is meant to be an innovative but feasible cross disciplinary project hence your team should have not only miners but have representatives from other disciplines to provide specialised input." You can view the outcomes of the students projects in the video below. The scenes showing holes being drilled into a white sphere are examples of the attempts at Off Earth Mining. For further info on how the course went you can also check out their facebook page. 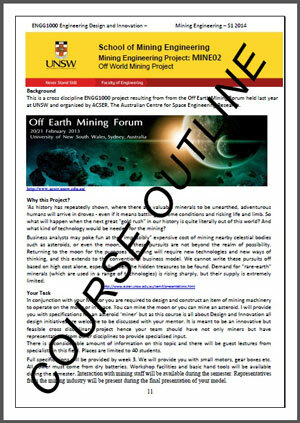 If you would like to find out more about the ENGG1000 Off Earth Mining project contact Dr Chris Daly at the School of Mining Engineering. If you are interested in pursuing research in the field of Off Earth Mining please check out our PhD offerings via the menu links above.